Oh Jerry! I had prayed this day would never come. You fought so bravely and I was sure if anyone could beat this disease it would be you! You've been a great friend to me since 1967 when we moved to Swann Dr. You were my right hand man in Nac for our reunions -- from hosting the picnic, to donating auction items, to making sure I had a dance partner. Your smile was contagious, your love for Fern and Madi was amazing, and your courage in this last battle was inspirational. We can't replace the hole your passing has left in our class. You will be in our hearts forever. Well, Jerry, it's over, you are in paradise, and what a journey it has been. The last few New Year's Eves spent with you, Fern, & my lil' birthday man, Madi, have been some of the best I've ever had. You have been so well respected in the community, and it was evident by the many that attended your fund raiser in June, the number of friends that helped you at home, and in the nursing home these last few months. It was an honor to be your friend and spend the last few hours of your life with you, Fern, Madi, and your awesome, sweet, sister, Betty. What memories we have made, what a wonderful man, husband, father, brother, and friend you have been! We love and miss you, and you know we will take care of Fern & Madi. Rest peacefully, Jerry, we will see you again! Funeral for Jerry Wayne Simmons, 57, of Nacogdoches will be at 10 a.m. Saturday, Feb. 16, 2013, at First United Methodist Church with the Rev. Brian Tyre officiating, assisted by Dr. Bill Gandin and John Derrick giving the eulogy. Burial will be in Simpson Campground Cemetery. Mr. Simmons died Wednesday, Feb. 13, 2013, in Nacogdoches. He was born Dec. 13, 1955, in Nacogdoches. Visitation will be from 5 to 7 p.m. Friday, Feb. 15. Laird Funeral Home. Jerry, we have become friends recently with Madi and Gage and I really wish I had know the man everyone is praising and call Friend. I love your son as my own and will cherish having him around our house. We will love and take care of him as you would. You will be missed but you are in a far better place. I appreciate you allowing my son to drive the rental car on the airstrip behind your house. It was back in 2004 during our 30th Reunion and you had invited us over for a visit. He was eager to learn to drive and at 14-15 I had been taking him to fields and vacant parking lots and sitting in the front seat with him. Him driving on your airstrip gave me the confidence to let him drive the car alone. By allowing him to do that, it showed that I had developed a level of trust in him. And your hospitality was instrumental in making that happen. He is now in the Air Force and stationed at Yokota Air Base, Japan. And, by the way, he bought a car and drives there as well. I don't think of you as "gone". Just "gone on". Funeral services for Mr. Jerry Wayne Simmons, 57, of Nacogdoches, Texas will be held on Saturday, February 16, 2013, at 10:00 AM at First United Methodist Church with Rev. Brian Tyre officiating, assisted by Dr. Bill Gandin. John Derrick will present the eulogy. Burial will follow at Simpson Campground Cemetery. Mr. Simmons passed away peacefully on February 13, 2013, in Nacogdoches. He was born on December 13, 1955, in Nacogdoches, Texas to the late Fred William Simmons and Lucille Luman Simmons. Jerry grew up in Nacogdoches. He graduated from Nacogdoches High School in 1974 and attended Stephen F. Austin State University. His banking career spanned a total of 30 years. He worked for Commercial National Bank for over fourteen years and was Vice President at First Bank and Trust since 1998. He enjoyed the loyalty of many customers during his lengthy career. He was a past member of the Chamber of Commerce, a member of the Fredonia Rotary Club, a member of Milam Masonic Lodge #2 and was on the Board of Directors for Woden Water Supply. Jerry found a passion for flying through his relationship with the late Bill Meazell. He was a die-hard fisherman and shared a love of hunting with his son, Madi. He taught Madi to shoot and respect firearms at an early age. He gained pleasure from Madi’s involvement in football and basketball. Jerry was an avid turkey hunter, was mechanically inclined, a practiced carpenter and a talented BBQ cook. Jerry was a member of First United Methodist Church and had a close relationship with the New Hope Church family and its pastor, Brian Tyre. 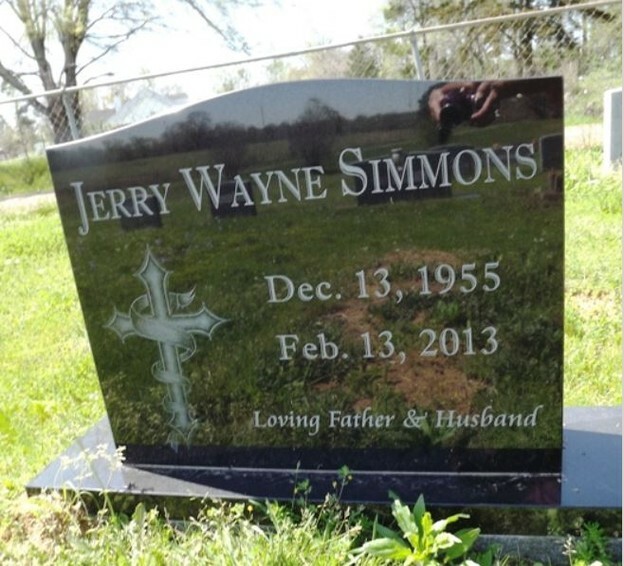 Jerry is survived by his loving wife of 24 years, Miriam Fern Simmons and his son, Madi Simmons, both of Nacogdoches; one sister, Betty Pierce and husband, Allen of Douglass; as well as other extended family members and good friends. Pallbearers will be Jimmy Mize, John Derrick, Marty Sowell, Matt Williams, Chris Taylor, Corey Ashley, Cody Cockerham, Henry Touchette, Johnny Lathrop and Joe Weaver. Honorary pallbearers will be Judge Mike Worsham and Brent Boyd. In lieu of flowers memorial tributes may be made to the Madi Simmons College Fund, C/O Jimmy Mize, 1009 N. University Dr., Nacogdoches, Texas 75961. Visitation will be held on Friday, February 15, 2013, from 5-7 PM at Laird Funeral Home. Click here to see Jerry Wayne's last Profile entry.